Chapel en le Frith, Derbyshire. We don't know whether this Chapel had a graveyard. This Place of Worship was founded in 1831, but we understand it was closed after 1874. 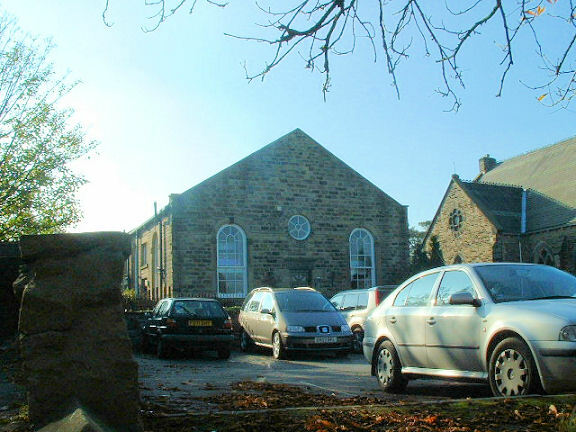 Here is Chapel en le Frith's early Methodist Chapel, standing next to (on the east side of) the present-day Methodist Church. It is recorded in White's Directory of 1857 being at Chapel Town End, and erected 1831 as "a good substantial building, will seat about 400". The same White's Directory also records that the Presbyterians formerly had a chapel here. I don't know where this was, but perhaps the name of this part of town as "Chapel Town End" might give a clue. Town End Chapel, Chapel en le Frith shown on a Google Map. Places of Worship in Chapel en le Frith shown on a Google Map. Information last updated on 20 Nov 2010 at 16:45. This Report was created 29 Mar 2019 - 23:30:44 GMT from information held in the Derbyshire section of the Places of Worship Database. This was last updated on 6 Feb 2019 at 15:49.